Review Student debt in the United States now stands at $1.2 trillion. In the UK outstanding student loans top £100 billion. Microsoft has made an fascinating contribution to the student debt crisis, by attempting to increase it. The machine I am typing on is a locked-down laptop aimed at "students" and "classrooms" that costs £1,549. 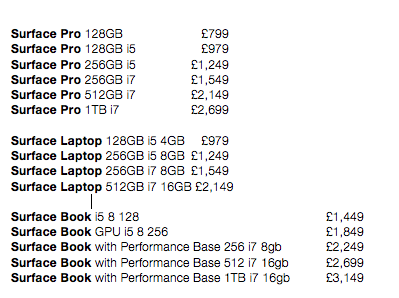 Tricked out with 512GB of storage it would cost a student £2,149. 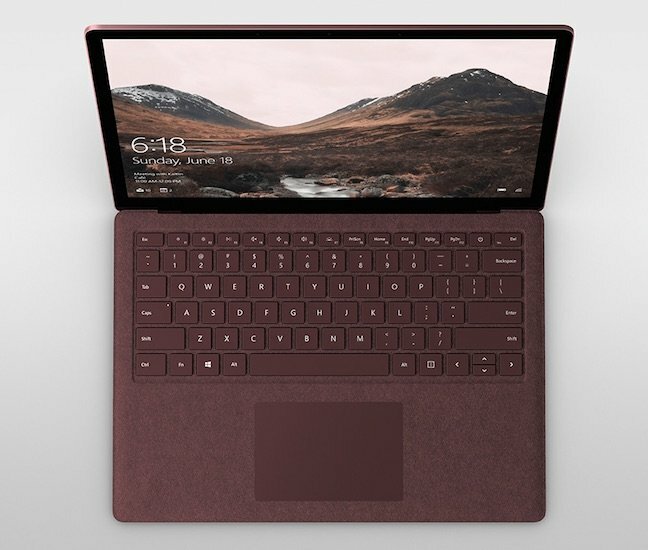 It may seem unfair to introduce Microsoft's first ever laptop by reminding you that this is a luxury good with an eye-watering price aimed at the debt-encumbered, but initially, the price of the Surface Laptop is what will define it. Which may be unfair, but Microsoft chose to fight here, not us. That's not the whole story, though. 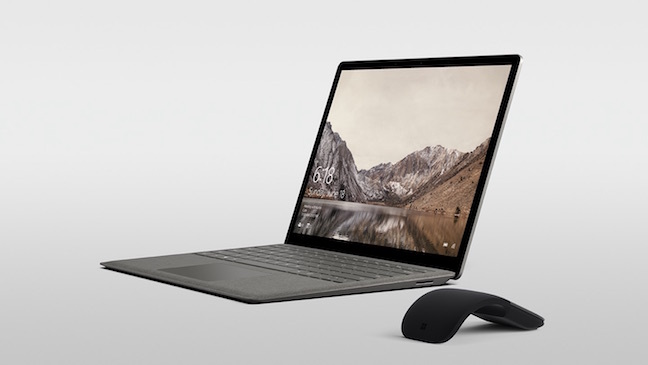 The Microsoft Surface Laptop is of course much more than a locked-down device, and the TV ads are at pains to show us that it's really a premium laptop for wealthy people. To do so means undertaking an official "jailbreak", converting Windows 10 S into full fat Windows 10. Extracting it from the shackles of Windows 10 S is free (for now) and just takes a couple of clicks, fortunately. So, if what you're looking for is a Windows equivalent to the MacBook Air, then here it is. I thoroughly enjoyed using it, and I'm certain it will sell to business executives by the truckload. From a design point of view Microsoft has done a terrific job. 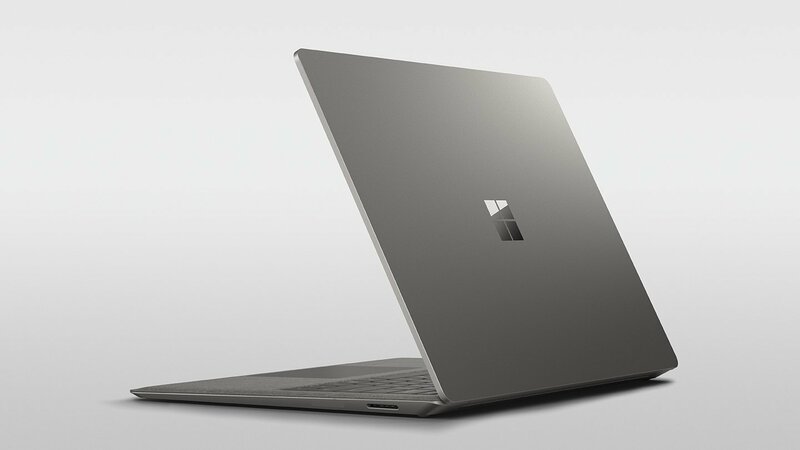 The Surface Laptop is a shade lighter than the MacBook Air, but most definitely heavier than the newer, featherweight MacBook. Then again, that is a severely compromised machine, so compromised it may account for why you're looking at a Windows replacement for a Mac. The MacBook has an awful keyboard and a brutal port selection. The Surface team wisely decided not to copy it slavishly. The Laptop's bezel is much narrower than the MBA, and the hinge is smart and straightforward. Of course, being a Surface, you get a spectacular display: 2256 x 1504 pixels, which comes to around 201 pixels per inch. The m3 and i5 options have no fan, while the i7 is designed to be “almost-fanless”, a claim which in Win10 S operation at least, I found was fully justifiable. The battery typically got me through 7 or 8 hours, sometimes more, although this is far short of the somewhat misleading “video endurance” figure of 13+ hours quoted by Microsoft in its marketing materials. The styling is restrained, and the port selection is conservative, and I welcomed both design decisions. It comes with USB 3.0 and a mini display port - but no USB-C. The designers must have thought: "let Apple shoot themselves in the foot, by removing the ports that everyone uses today, we won’t”. Few would have minded a second USB 3.0 port, though. . It would have been smashing to have LTE SIM card support, something promised for the Surface Pro later this year. On this year’s Surface keyboard and the laptop too, you can finally set the screen brightness in hardware. (Previously the "brightness" function keys let you set the brightness of the keyboard backlight). The decision to surround the keyboard with a specially treated fabric has caused plenty of comment. This is not your regular alcantara, such as you find on Samsung’s S8 cases. That feels fuzzy to the touch, but this is peculiarly smooth: it’s been treated to repel moisture from sweaty palms, Microsoft told us. Only time will tell will how these lovely machines look after two years. The accumulation of acidic sweat, grease and random spillages onto a laptop really takes a toll - surely only more so from a student "lifestyle": alcohol, bodily fluids and lentils. For now I can only say that it looks and feels great. It comes in four colours, a "Cobalt" Blue that isn't really cobalt, it's less saturated, while the Burgundy option looks terrific. The keyboard itself turned out to be one of the machine's main attractions. Few machines could lure me away from a Thinkpad T series for serious longform thousands-of-words-a-day writing, but this is the next best I've found. Audio is surprisingly good, given that it is forced through the fabric of the keyboard bezel. Oops! Never mind, it's only water. 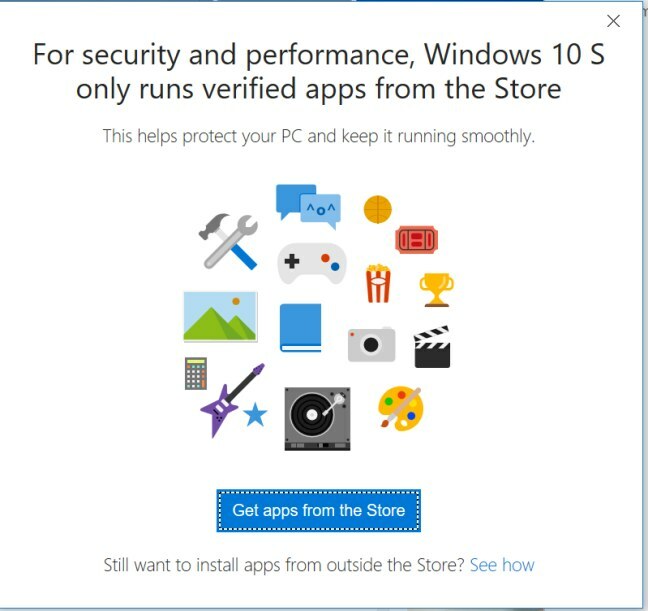 So onto Windows 10 S, the “locked down” version of Windows 10 which only runs managed apps through the Windows Store. For your regular Win32 apps, you can set up a VDI or an RDP connection to a “real” computer. Even though you’re actually running one. Yeah, I know. Bizarre. There are other limitations: Edge is the browser ("since it’s more secure than Chrome or Firefox”) and in a fairly petty and pointless decision, Edge will only run Bing. The Store does carry one or two other browsers: Monument, which has a background ad-blocker, and the venerable UC Browser, which is four years older than Google Chrome, and owned by Alibaba. They're really decent basic browsers, but if you rely on a Chrome plug-in, you're basically stuffed. So in reality, how far can you go without jailbreaking your Surface Laptop? Surprisingly I managed to work happily with Office, Evernote, Irfan View, Slack and Todoist - all present and available in the app store. Spotify and iTunes are either in the Microsoft Store, or will soon arrive. But I soon began to miss things I take for granted. The built-in Mail client is inadequate for serious work, while full blown Outlook means taking a huge productivity hit, since its search is too slow to be useful. So when I use Outlook, I index the mail with X1 Search. But X1 isn't a Store app, and won't run. Ow. I would need to re-purchase Adobe apps I already subscribe to, because Creative Cloud is not a Store App. This means a downgrade and a migration away from Lightroom. That's a non-starter. The biggest showstopper you'll encounter is probably going to be printing. If you need the full feature set of a specific driver, and that driver isn't bundled with the OS, then you may well be stuck, for most printer companies supply their drivers in .EXE self-extracting zips. And those .EXEs don't run. So for the professional mature audience - and that is most of you lot - I wouldn't even hesitate to perform the upgrade to full fat Windows 10. It'll be the first thing you do. Surface pricing for the UK, VAT inclusive. The "Book"
After seven years, Apple got bored with its near-perfect MacBook Air design, and now, the PC world finally has an excellent alternative. Purely from a hardware standpoint, Microsoft's debut Laptop is superior to Apple's MacBook. It's only thanks to Apple's better software and apps bundle that the gap closes in the final reckoning: Windows never seems finished and remains clunky. The out-of-the-box app selection on MacOS - including Mail, Photos, and with Garageband and iMovie, Pages and Numbers no more than a click away, blow away the "applets" bundled with Windows.